Most people don’t realize that the Hyde Park area is split into what’s essentially two completely different and distinct neighborhoods. The original Hyde Park neighborhood is located south of 45th St and is simply referred to as Hyde Park (234 acres) or sometimes South Hyde Park. The neighborhood that’s north of 45th St is referred to as North Hyde Park (253 acres) or sometimes called the Hyde Park Annex. 45th St is the boundary between the two areas. When it comes to zoning regulations the neighborhoods are separated into two completely separate NCCD zoning overlays. The NCCD south of 45th St called the Hyde Park NCCD was created in 2001. The NCCD north of 45th called the North Hyde Park NCCD was created in 2005 largely as a response to limit change near the original Hyde Park neighborhood. They are entirely separate NCCDs between the two neighborhoods and one is not associated with the other, so adding, changing, or removing one NCCD does not impact the other neighborhood. These NCCDs are what make both neighborhoods exempt from CodeNEXT, ban ADUs from the neighborhood, and mandate other onerous zoning requirements. When most people think of Hyde Park they generally think of the area that’s south of 45th St, which might be a walkable neighborhood with plenty of sidewalks, some small apartment complexes mixed in with other housing types, a commercial area within the interior of the neighborhood that’s home to Quack’s, Julio’s, and FreshPlus, and Avenue B Grocery that’s directly next to single family homes. Almost all of the missing middle housing in both of these neighborhoods combined is located in Hyde Park, even though that missing middle housing is disappearing. This is also the area that has a local historic district between 38th St and 45th St with some historic homes scattered throughout the neighborhood. Unfortunately, according to city staff and CodeNEXT consultants, even if rezoned under CodeNEXT, the local historic district will mainly prevent a greater diversity of housing from coming into the neighborhood. A lot of the Hyde Park neighborhood has also been redeveloped with large lot single family homes, so even without the local historic district there’s been a lot of housing opportunities lost in the neighborhood already. 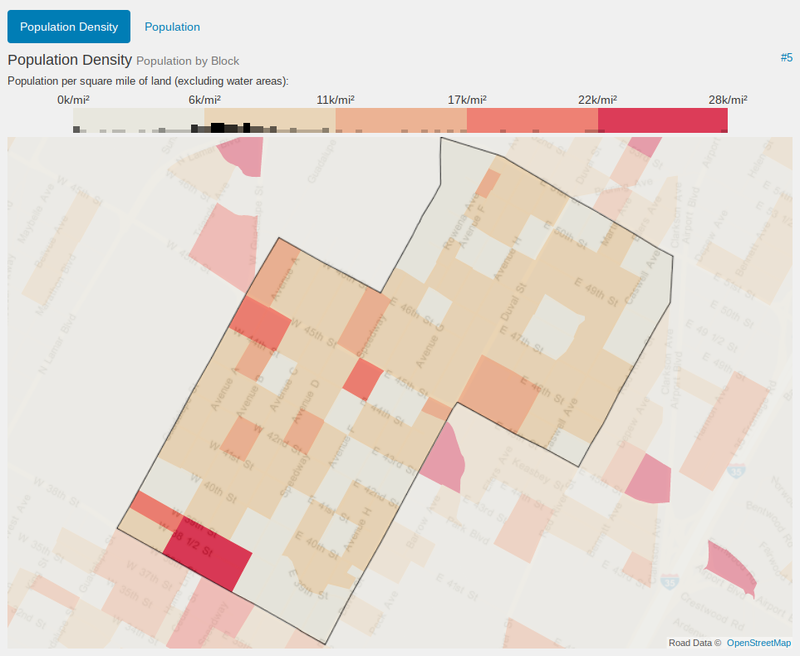 North Hyde Park generally doesn’t have a mix of housing types. It’s almost entirely older low density single family homes with very few duplexes, ADUs, or other housing types. 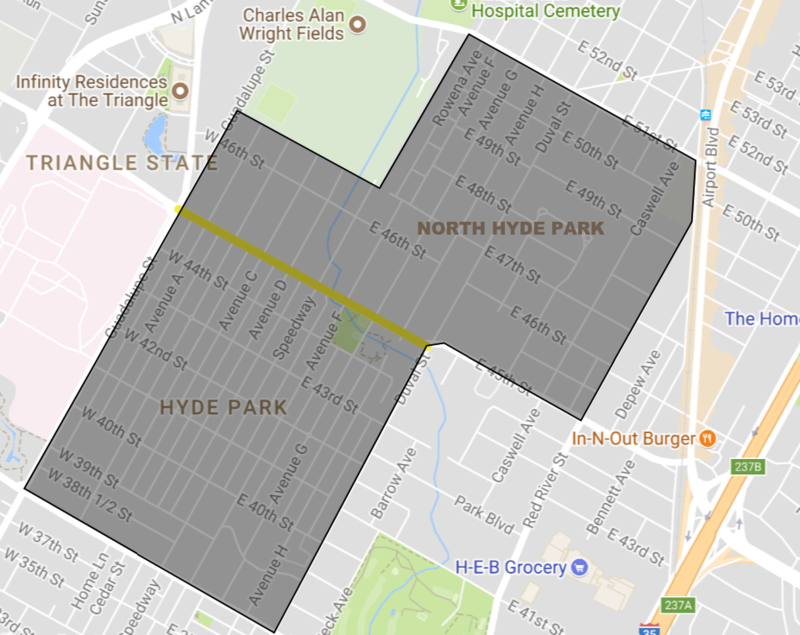 North Hyde Park also lacks general walkable amenities that are more common in the Hyde Park neighborhood since walkable amenities and other businesses have been banned from surrounding the neighborhood under the North Hyde Park NCCD. If residents of this neighborhood want to walk to a local business or restaurant, they generally have to walk to the south into the Hyde Park neighborhood or north into North Loop. Because there are almost no sidewalks in the entire neighborhood they have to walk on the street to get there. Money paid into the sidewalk fund from North Hyde Park residents is used for the sidewalks in Hyde Park, which creates unbalanced walkability between the two neighborhoods. There is no local historic district in this neighborhood since there are almost no historic homes. This neighborhood is in the process of being redeveloped now and so there’s still an opportunity to include new diverse housing types into this low density neighborhood. The best opportunity to include new housing in the Hyde Park area under CodeNEXT is the North Hyde Park neighborhood. However, if the neighborhood remains exempt from CodeNEXT, then we might lose the opportunity to have more affordable missing middle housing here and instead housing will mainly be replaced with large lot single family homes, which is the only option allowed under the NCCDs. There’s no stopping the neighborhood from changing, but we have a rare opportunity to improve the neighborhood in the process by having our neighborhoods rezoned under CodeNEXT to allowing more affordable missing middle housing, deeply affordable housing, amenities and restaurants located within walking distance, and to allow more housing to be built near our corridors and major roads. Friends of Hyde Park recently made recommendations to CodeNEXT that includes applying CodeNEXT to the Hyde Park neighborhoods. When you refer to Hyde Park just remember there’s more than one Hyde Park.